River Valley senior Kelsey Brown (34) attempts a spike, during the Lady Raiders straight games victory on Monday in Racine, Ohio. Southern junior Mickenzie Ferrell (8) hits the ball over the net, during the Lady Tornadoes’ loss to River Valley on Monday in Racine, Ohio. RACINE, Ohio — It’s a winning streak. 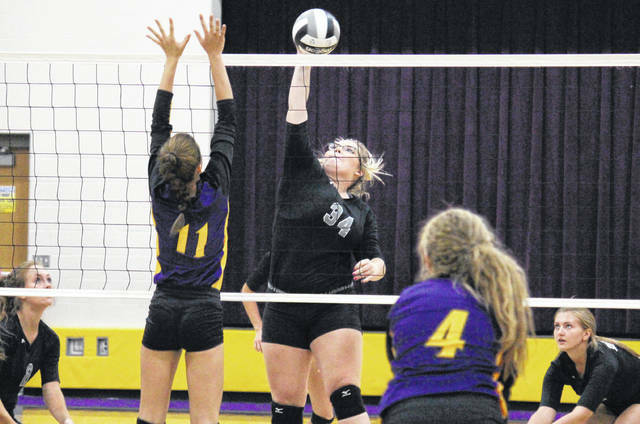 The River Valley volleyball team picked up its third victory in as many chances on Monday evening in Meigs County, defeating non-league host Southern in straight games. In the opening game, River Valley (3-1) led initially, surrendered the lead to Southern (0-2) briefly at 3-2, but regaining the edge at 5-4. SHS tied the game at seven, but failed to regain the advantage. The Lady Raiders went ahead 1-0 in the match with a 25-17 victory, with the final margin of eight being their largest lead of the game. After 22 points were played in the second game, the teams were tied for the fifth time. River Valley claimed the next four points and didn’t relinquish its lead on the way to a 25-18 win. Through 30 points in the third game, the teams had fought through five lead changes, no team had lead by more than three, and Southern held a two-point edge. River Valley tied the game at 16, 17, 18 and 19, before finally regaining the lead at 20-19. RVHS claimed the next four points and cashed in on their third attempt at match point, sealing the 3-0 sweep with a 25-21 decision. Following the triumph, second-year RVHS head coach Brent Smith noted how important this win was to his club. “For our seniors, this is their first experience with a small winning streak,” Smith said. “We knew coming in that we’d have to maintain Baylee Wolfe, just from last year’s film. We knew they’d be scrappy and we knew they’d go for the corners, which we didn’t cover that particularly well. We need to work on that before we move forward. 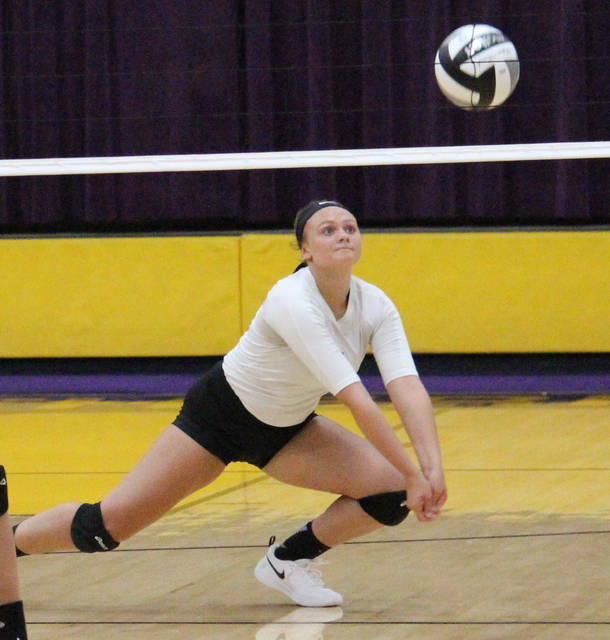 For the Lady Tornadoes, third-year head coach Kim Hupp noted the areas for improvement carrying over from Southern’s season-opening loss to Meigs. The Lady Raiders held an advantage of 87.7-to-81.0 in serve percentage, and an edge of 60.3-to-46.6 in side-out percentage. 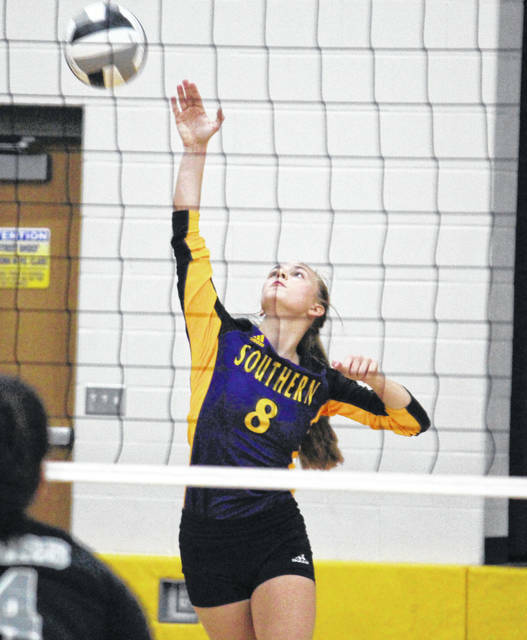 RVHS had a hitting percentage of 16.4, while Southern’s fell below zero. RVHS senior Kelsey Brown led the Silver and Black service attack with 12 points, including four aces. Lora Kinney and Kasey Birchfield each recorded nine service points, with Kinney earning an ace. Mikenzi Pope had four points, Alexandria Wood added three, while Rachel Horner had two points and one ace. For Southern, Kassie Barton recorded team-highs of 11 points and three aces. Baylee Grueser had five points and one ace, Marissa Brooker added three points, while Baylee Wolfe chipped in with two. Phoenix Cleland and Peyton Anderson contributed a point apiece to the Lady Tornado cause. The Lady Raider net attack was led by Brown with five kills and a block. Pope and Horner each had four kills, Hannah Jacks added two kills, while Wood, Birchfield, Jaden Bradley and Taylor Huck each marked one kill. Kinney had a team-best eight assists, while Pope came up with a match-best 24 digs. The hosts were led by Wolfe with eight kills, followed by Jordan Hardwick with five kills and three blocks. Phoenix Cleland had three kills in the setback, while Brooker had one kill and a match-best 15 assists. 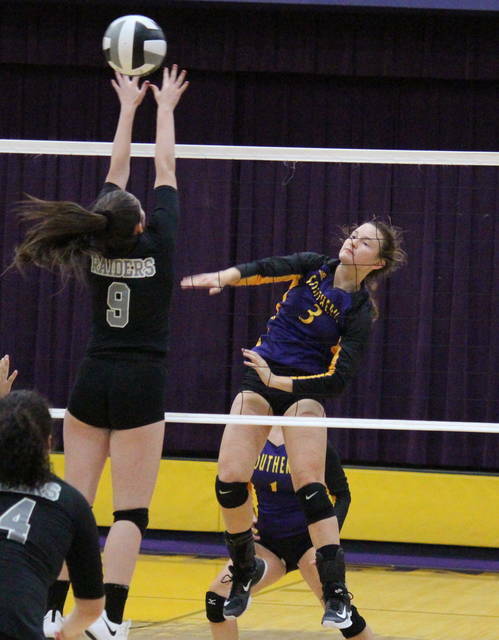 Wolfe also led the SHS defense with 12 digs. After visiting Meigs on Tuesday, River Valley will be back in its home gym to face Wellston on Thursday. Southern is back home against Miller on Tuesday, and then will visit Eastern on Wednesday.